Huskypoint is a family-owned private company operating in Rovaniemi and Ylläs. As one of the pioneering organizers of husky safaris in Lapland they offer sled dog adventures for incentives, holiday groups and individual travellers. After 20-years of dog life they can say that huskies are our life, hobby and passion. 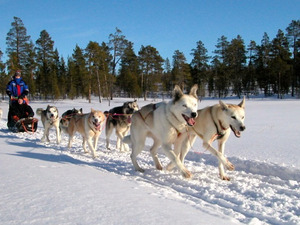 We offer husky adventures both winter and summer. There is plenty of variety from short drives to multi-day safaris. Choose your favourite and step into the exciting world of sled dogs!